Drug Testing Facts: Why Drug Test? Testing for drugs is not a viable solution for drug addiction and abuse. However, it can be a powerful deterrent for the child until real help such as drug addiction treatment takes place. There are several goals that can be achieved through testing for drugs. The first is that it deters children from initially trying drugs. Second, it is a method to help identify children who have just begun experimenting with drugs. Lastly, it helps to identify children who have already developed a drug addiction or have a serious drug abuse problem. The government has guidelines regarding drug testing. These were created by NIDA-The National Institute on Drug Abuse and SAMHSA-the Substance Abuse and Mental Health Services Administration. They mandate that companies that use commercial class driver’s licenses for their employees must have a drug testing system. This test is required to test for five specific groups of drugs. Due to these standard requirements many drug testing companies check for these five common categories. The five most common drug groups that are tested for are cannabinoids (marijuana, hash), cocaine (cocaine, crack, benzoylecognine), amphetamines (amphetamines, methamphetamine, speed), opiates (heroin, opium, codeine, morphine), and phencyclidine (PCP). 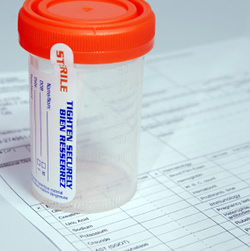 There are five main ways of drug testing an individual: urine, blood, hair, saliva, and sweat. Testing the individual’s urine is the most common method. It is the less expensive and intrusive than taking blood. It is the least expensive method ranging from $7-$50 for a home test. It can be done at an individual’s home (parents testing children). However lab verification is for accurate results. This method can usually detect drug use within the past week. This method can give inaccurate results if the individual abstains for a period of time before the test. Often times the samples are temperature tested to insure the sample’s integrity. It is somewhat more expensive than urine testing ($15-$75). It is considered one of the most unobtrusive methods of testing. This method is easy to administer but does require a lab to process the results. It can detect drug use primarily within the last few days. This method is more reliable for the detection of meth and opiates but is considered less reliable for detecting marijuana. All things considered, it is thought to be an unobtrusive method of testing. This method has the ability to detect drug use of a longer period of time. This method does not usually detect drug use within the past week. This method requires sample of hair about the diameter of a pencil and 1.5 inches long. This testing method cannot be done with a single hair. This method often tests positive more often than the urine method. This particular method can even tell when a person started using and if and when they stopped using. This is the most expensive type of testing. This method is also considered the most intrusive method of all the testing methods. Blood testing is considered to be the most accurate method of testing for drugs. It is one of the least common methods of testing. This is a very intrusive method of testing because the individual must wear a patch for an extended period of time. This method is still uncommon when it comes to testing for drugs. This method is a controversial method of drug testing.